The second international conference on Power Instrumentation, Control and Computing (PICC2018), January 18-20, 2018, at Government Engineering College Thrissur focused on the recent trends in power electronics, power systems and the allied areas. The conference was organized by the Department of Electrical Engineering Govt. Engineering College Thrissur, Kerala, India. The conference was organized as part of the umbrella conference – Fifth biennial International Conference on Emerging Trends in Engineering science & Technology, ICETEST 2018. ICETEST consists of seven sub-conferences in different Engineering streams including PICC2018. Papers in PICC track are published by IEEE whereas papers in other sub-conferences are published by CRC Press. 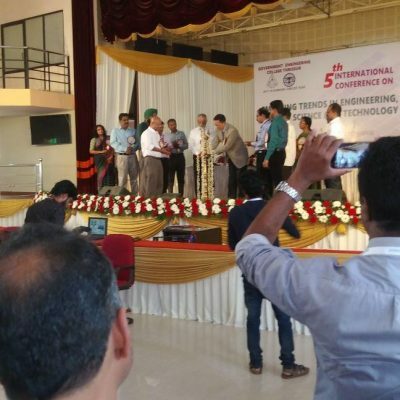 PICC2018 had technical sponsorship from IEEE Industry Application Society (IEEE IAS) and IEEE Kerala Section. The conference was proved to be a forum for technical exchange among researchers from academia, research groups, and industries. All the presented papers have been submitted to IEEE for inclusion in IEEE Xplore digital library. Out of the papers presented in the conference, 20 % of the papers have been selected for possible publication in IEEE Transaction on Industry Applications subject to further round of review of the journal. PICC2018 had 181 paper submissions from 8 countries including India and 85 papers were shortlisted for presentation at the conference after a rigorous review process by 113 reviewers from 12 countries including India. Most of the reviewers are active researchers in reputed institutions. 82 papers were presented in the conference. Two papers were from outside India. 36 papers were from different NITs and 19 papers were from IITs. 84% of the papers (69 papers) were from outside Kerala and only 16% (13 papers) of papers were from inside Kerala. All the presentations were oral presentations. No online presentation was permitted to ensure maximum participation and interaction of participants in the conference. The technical Program of PICC2018 consisted of five keynote talks in the focus area of the conference and seventeen technical sessions. The sessions were chaired by active researchers from reputed institutes.